Welcome back to the Support Synergy series! This series focuses on all of the different support heroes available in the Halcyon Fold, and which heroes to pair them with. 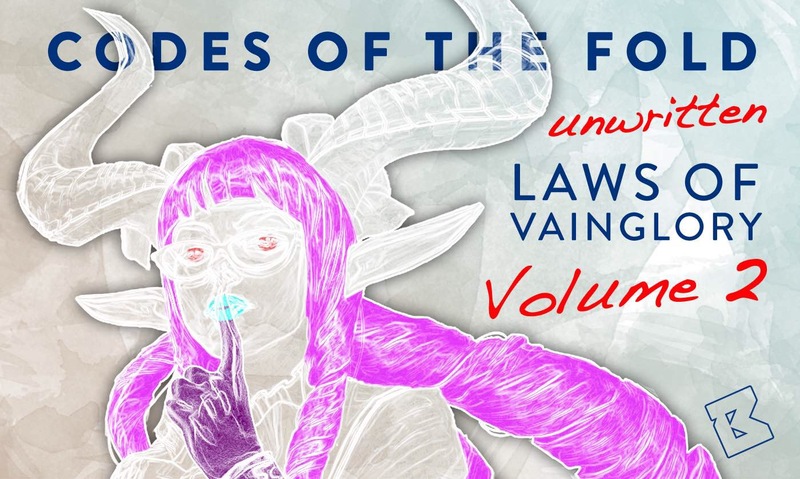 In previous entries, we’ve looked at Fortress, Catherine, Ardan, Adagio, Phinn, Lyra, and Grace. Today, we’ll be analyzing Baptiste. Captain Baptiste, or “Captiste,” has been catching on as a popular captain selection since the summer, due mainly to his heavy crowd control (CC) and flex pick nature. While Baptiste doesn’t have the same beefiness as other captain selections like Lance or Phinn, he has a unique and flexible enough ability kit to make him useful in many team compositions. Baptiste has some of the best CC abilities in the game, making him a great captain selection in teams focused on CC and lockdown. He can also work well in kiting compositions, locking down diving enemy heroes with Ordained and peeling off the entire enemy team with Fearsome Shade. Baptiste can also work in the right diving composition with an early priority on War Treads or even Journey Boots to get in range for his abilities. Finally, he functions extremely well as a flex pick, with the ability to play either captain or jungle at a high level, which will keep your opponents guessing in draft. Let’s look at each of Baptiste’s abilities in depth to understand what makes captain Baptiste tick. Baptiste steals “soul fragments” from enemies by hitting enemies with either basic attacks or abilities. Each soul fragment stolen recovers a small amount of health for Baptiste. Upon collecting his fourth soul fragment, Baptiste becomes “empowered” for four seconds, during which time Baptiste’s basic attacks and abilities deal increased damage (though he does not collect more soul fragments during this time). This perk’s primary power comes on jungle Baptiste, creating huge power spikes that blow up enemy carries. But captain Baptiste still benefits from the sustain and extra damage, especially in the early game, when he can use the sustain to stay in team fights and the damage spikes to help secure a kill. Baptiste throws a vial of liquid a short distance. Upon reaching its max distance or hitting an enemy hero, minion, or structure, the vial explodes, dealing area of effect (AOE) damage and slowing nearby enemies. Again, this ability shines primarily when Baptiste is played in the jungle, but the early game damage, sustain, and slows can help tilt teamfights in your favor. Bad Mojo can also be used to give you “soft” vision by tossing a vial into a nearby bush and seeing if any soul fragments come back your way. If one or more do, then you know an enemy is in there waiting. Baptiste marks his target, damaging them and creating a small circle around them that lasts 2.5 seconds. If the target leaves the circle, they are stunned and take additional damage. This is a great CC ability and one of the reasons captain Baptiste works so well. In a lockdown, CC-focused composition, you will usually want to Ordain the enemy carry as soon as a team fight starts, allowing your carries to unload their own CC while the enemy is helpless to run away. For a dive composition, you will also want to Ordain the enemy carry early on in team fights, but make sure to wait until your carries are in position to deal heavy damage while the carry is Ordained. In kiting compositions, you will want to be more selective with your use of Ordained, saving it for when your carry is in the greatest danger of getting dived on or taking heavy damage. Baptiste summons waves of “shade,” lost souls from the underworld brought up to terrorize your enemies. Enemies caught in the shade are “feared,” which causes them to flee backwards and does not allow them to control their movement or use any items or abilities for the entire duration of the fear. Making a strong case for the best CC ability in Vainglory (with apologies to Blast Tremor), Fearsome Shade is the primary reason anyone plays Baptiste as a captain. No other ability in the game allows you to lockdown an entire enemy team and set up team fight victories quite like Fearsome Shade. How and when you use Fearsome Shade will determine how successful of a captain Baptiste player you become. It is best used in the middle of a team fight, when your carries are in position to dish out heavy damage or CC while the enemies are helpless to do anything but flee and die. Try to predict when the enemy captain may want to use their Fountain of Renewal, and cast Fearsome Shade just before that so you can prevent them from getting a team-wide heal before you pick off one or both of their carries. 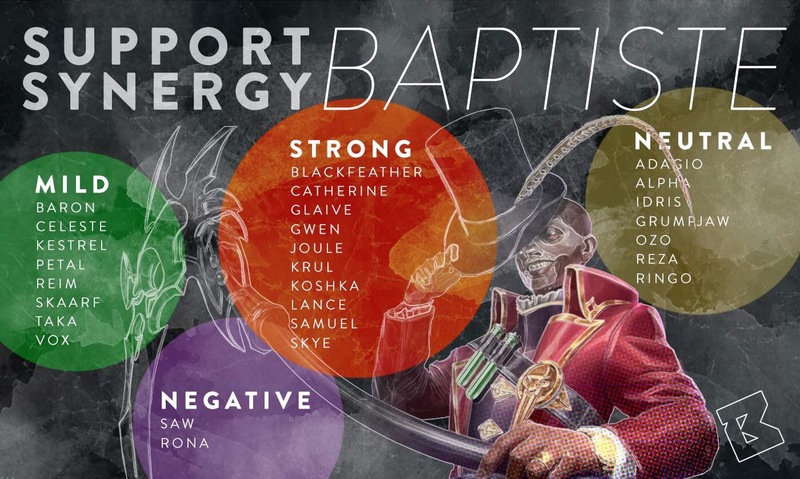 Also place a heavy priority on the item Echo when playing captain Baptiste, as two Fearsome Shades in one team fight plus Ordained can often be too much CC for an enemy team to deal with. While Baptiste’s CC abilities are incredibly strong, he needs to be in range of the enemies to use them. As his abilities have a relatively short range, a kiting team or heavy damage backline carry like Celeste or Skaarf can stay far enough away that Baptiste never even gets the chance use his CC. Compounding this problem, Baptiste is also incredibly immobile, with no innate movement abilities and a fairly slow walking speed, meaning his only chance at closing gaps is with boots. Finally, as mentioned previously, Baptiste does not have the beefy frame like some other captains, so he cannot take the same level of frontline punishment. This means Baptiste can also struggle against especially aggressive diving compositions that can dish out damage in a hurry and force Baptiste and his teammates onto the backfoot. Baptiste functions best as a captain when he can make the most of his CC, and therefore usually fits best in compositions based on chaining together all types of CC. Ordained and Fearsome Shade with Echo is often too much for an enemy team to try and Reflex Block and Crucible out of, so any allies that can stack even more CC on top will fit great with Baptiste. Baptiste can also work in diving or kiting compositions, but sometimes his lack of mobility and lower defensive stats would be better substituted out for a more traditional captain in those situations. Blackfeather: As the only hero in the strong synergy ranking without heavy CC of his own (spoiler alert), Blackfeather has enough dive to always get into the right position for Fearsome Shade, enough sustain and barriers to make up for Baptiste’s lack of defensive abilities, and enough mobility and chase to hunt down kills that might otherwise slip away from Baptiste. Catherine: Though Catherine should always be played as the captain and Baptiste as the jungler when they are paired together, it is worth including Catherine here just because of how strong of a duo they make; perhaps the strongest in Vainglory at the moment. If your team drafts Baptiste early as a flex pick, and you find Catherine still available when the draft turns back to your team, you should almost always select her. Blast Tremor plus Fearsome Shade plus Merciless Pursuit plus Ordained often equals far too much CC for enemies to deal with, even at the professional level. While you likely will not find Catherine falling to you after selecting Baptiste, you should take her when she does. Glaive: Glaive makes another strong partner for Baptiste. Baptiste can Ordain an enemy and make them easy pickings for an Afterburn, or Glaive can lead off with an Afterburn and Baptiste can Ordain them in an unfavorable position. Glaive can also dish out heavy damage in a hurry while enemies are locked into Fearsome Shade. Additionally, Glaive can flex into the captain role and can play either jungle or carry, allowing for maximal draft flexibility. Gwen: Gwen is one of few carries who can both dish out heavy burst damage and multiple forms of CC. Confining an enemy with Ordained makes the Buckshot Bonanza and Aces High combo deadlier, and Aces High sets up Fearsome Shade nicely, which sets up Gwen to secure a kill. Gwen also comes prepared with her own means of escaping bad situations; something other carries sorely lack when paired with Baptiste. Joule: Ordained sets up Joule for a nice Rocket Leap, and once she leaps into the middle of the fight, Joule is also in perfect position to blow up the enemies during Fearsome Shade; either through huge crits when built weapon power or massive ultimates when built crystal power. Koshka: Yummy Catnip Frenzy is the deadliest single-target lockdown ability in Vainglory. Why not pair it with the deadliest team-wide lockdown ability in Fearsome Shade? Krul: At first thought, Baptiste and Krul seem to fit mostly because of their CC chaining and quick diving kills, and they definitely do. But they also work well as a tricky frontline for enemies to navigate for a heavy damage backline carry like Celeste or Skaarf. Lance: Lance’s CC abilities pair up extremely well with Baptiste’s. Ordained makes it easier for Lance to land Impales, while Fearsome Shade can direct enemies towards a wall or structure for a stun with Gythian Wall. Additionally, Lance can flex into either captain or jungle, making for a malleable team composition. Samuel: Samuel does best when he can dance around the fight and keep enemies at arm’s length. With Baptiste there to help lock enemies down, Samuel can do just that. Plus, Oblivion and Fearsome Shade make for a killer chain of CC that is often enough to lock up fights. Skye: As perhaps the most mobile hero on the Halcyon Fold, Skye does well to offset Baptiste’s immobility. Similar to Samuel, she can dance around the fight while Baptiste does all he can to keep enemies away from her. Alpha: Alpha can be a bruiser, but if she has to chase enemies down without much help from her captain, she will not find anyone to bruise. The combined immobility of Baptiste and Alpha can be tough to overcome, but with well timed use of Batpiste’s CC, they can find enough lockdown for Alpha to secure a kill. 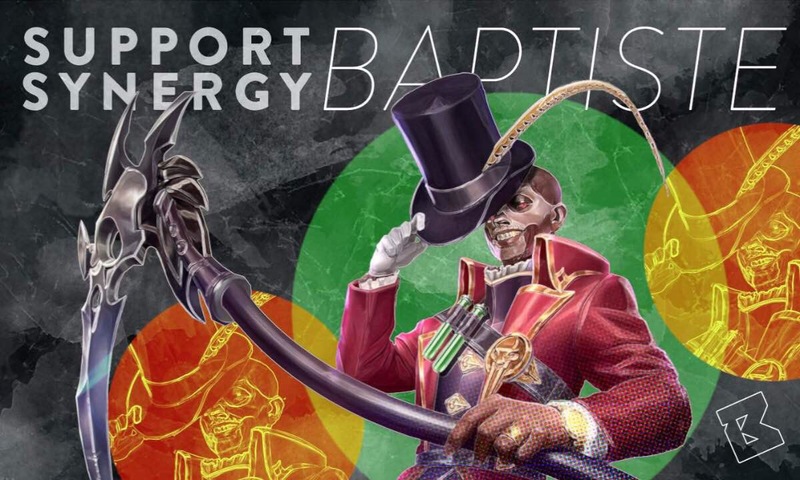 Baron: Baron has both the burst damage to blow up an enemy carry while Baptiste locks them down and the ability to reposition himself in Jump Jets to make the most of Fearsome Shade. If the enemy survives that combo, though, Baron can be left a sitting duck, and Baptiste does not have much left in the tank to protect him. Celeste: Celeste and Baptiste can make a deadly combo when they chain their stuns, and Baptiste can provide enough peel to let Celeste stay on the backline and dish out tons of damage. If enemies do find their way to Celeste, however, the combined immobility of Baptiste and Celeste can be a killer. Kestrel: Both weapon and crystal iterations of Kestrel pair fairly well with Baptiste. Her crystal build gets the slight edge due to the way she can dish out heavy splash damage with Glimmershot to one or more enemies caught in Fearsome Shade or blow up an Ordained enemy carry. That said, weapon Kestrel can function well enough with Baptiste too. Petal: Petal’s optimal use of Frostburn allows her to stay in position on the edge of fights, but be ready to leap in when Baptiste uses Fearsome Shade. Spontaneous Combustion also deals a modest amount of AOE damage when Baptiste manages to catch more than one enemy in the Shade. Reim: If Reim and Baptiste can get their mitts on the enemies, they can make it very difficult to get away from them—chaining together stuns, roots, more stuns, fear, and massive AOE damage. That is a big “if” though. If they both put a heavy early priority on Journey Boots or War Treads, they can make up for their lacking mobility, but sometimes even that isn’t enough. Skaarf: Skaarf’s damage output can be massive, and a properly timed and positioned Fearsome Shade into Dragon’s Breath can end a team fight very quickly. Baptiste can provide a decent amount of peel for Skaarf to fire off Spitfires from range so he can build up Broken Myth stacks, but if persistent enemies can find a way through Baptiste, Skaarf will be the one getting barbequed. Taka: Taka can dish out massive amounts of damage while Baptiste locks down the enemy team, then hide under his box to get away before they get over their fear. If the enemy manages to survive Taka’s burst, though, Taka will often leave Baptiste and their third teammate exposed. Vox: Wait For It… can line up a devastating silence into Fearsome Shade chain. If Vox gets the opportunity to build up some Breaking Point stacks before unleashing this combo, he and Baptiste can make a nasty duo. Adagio: Adagio’s heals help offset Baptiste’s lack of true defensive abilities when playing as captain. Paired with the right weapon carry, they can hold their own, but often times their combined total lack of mobility makes them easy pickings. Grumpjaw: Much like Baron, Grumpjaw can jump into position for Fearsome Shade and dish out a ton of damage in a hurry. 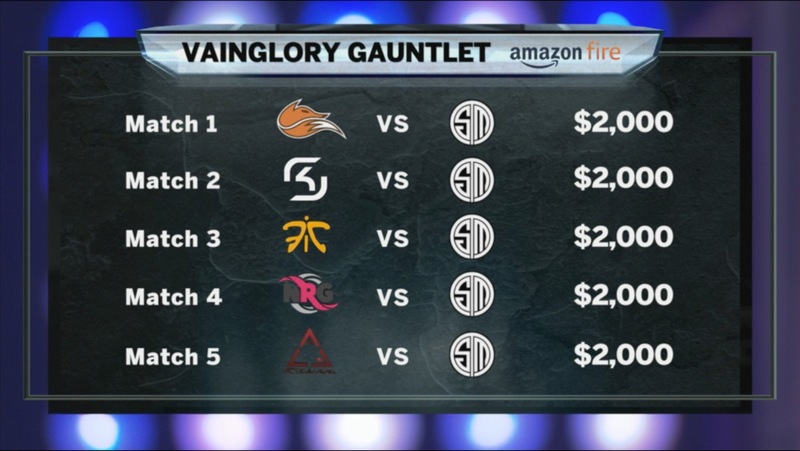 If enemies survive that burst combo though, Grumpjaw often finds himself on the wrong side of dead. Idris: Idris has the dancing shoes to get in and out of fights and play around Baptiste’s CC, but Idris often lives on a knife’s edge. While they can work as a duo, Idris functions better with a more defensive captain who can help him stay in the fight. Ozo: Ozo’s ability to bounce into the middle of a fight at a moment’s notice positions him well to pounce on opportunities created by Baptiste’s CC, but Ozo sometimes doesn’t pack quite enough of a punch to finish off the enemy carries, giving them a big enough window to escape and heal back up. Reza: Reza can jump into the middle of fights and blow up enemies, which pairs well with Baptiste’s CC and some impeccable timing. If enemies survive or dodge the burst, though, Reza needs protective abilities to keep him in the fight; something Baptiste is not equipped to provide. Ringo: Ringo’s damage output can be formidable, but without much of an ability to escape on his own, Baptiste is not the ideal captain to pair with Ringo. Rona: Fearsome Shade pushes enemies away from Rona when she is in her Red Mist, which is the opposite of what she wants. These two are best left off the same team. SAW: Unless your TSM and can make CP SAW look like a jungle god, SAW is generally best left on the sideline in drafts. This is especially true with Baptiste as a captain, who cannot give SAW the sustain or protection that he typically needs, and whose ultimate ability often ends up pushing enemies away from SAW, which is the opposite of what he wants. As a flex pick with some of the best CC in Vainglory, Baptiste earns the title of voodoo daddy by keeping teams guessing in draft and locking down enemy carries in team fights to secure kills. Once you learn how and when to use his abilities, and especially how to chain with your teammates’ abilities, enemy teams won’t stand a chance.